Google AdMob & MS Ads, are two Addons available for mobile apps and can be easily activated by logging in to your account and clicking Get Addons. Notice that Google AdMob Addon is available for iOs & Android mobile apps, whereas MS Ads Addon is available for Windows Apps. What is Google AdMob & Microsoft Ads Addon? 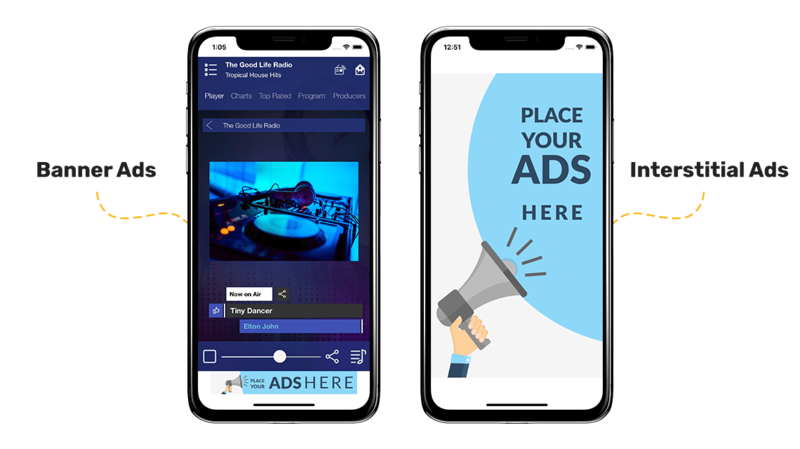 Google AdMob & MS Ads are advertising placement services for mobile apps by Google and Microsoft respectively that allow you to display video or image advertisements relevant to your app users and earn money when they view or click them. On which plans are they available? Both Addons can be activated on Enterprise & Radio Network mobile plans. Please note that Starter mobile plans contain our own ads while Business plan is ads-free. What is more, both Addons are not included in Golden Addon in Starter & Business app subscriptions. Where can I place AdMob & MS Ads on my mobile apps? Looksomething apps support smart banners or banner ads and Interstitial Ads, with the first ones being displayed on the bottom of the screen for as long as the app is active while the latter ones are displayed in full-screen once the app launches. Please mind, that mobile banner positions are fixed and cannot be altered nor increased in number. How can I set them up on my mobile apps? Regarding step number 4, you will have to provide us with one Ad unit ID for each banner Ad and on for each Interstitial Ad. For example, if you want to display one banner ad on your iOS mobile app you will have to create one Ad unit ID. In case you want to display ads on your Android mobile app as well you need to set up two Ad unit IDs, one for the android app and one for the iOS one. You can easily recognise IDs; for example banner ads IDs look like "ca-app-pub-1847075713715043/768760"
In case you need more information regarding the creation of your AdMob account or about setting up your IDs please refer to this article. In order to activate MS Ads Addon on Windows apps, you need to contact us for more information. or view more info here.